MMDA and TV5 had joined in a project called Metro Manila Traffic Navigator, to help not only the motorists, but also the commuters to easily view the traffic situations in the Metro Manila major roadways. Information is specifically arranged to help the navigator clearly see the real-time traffic. 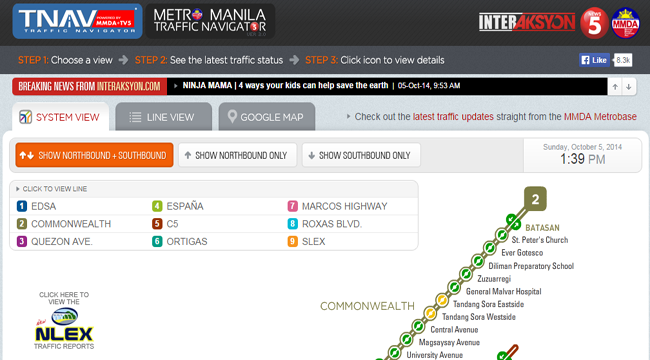 Powered by InterAksyon.com, Filipino can easily access the traffic updates in a world class way. Metro Manila Traffic Navigator is the first of its kind in our country as a digitized traffic info system that would assist the motorist and commuters on which route would be the best to travel and on what to expect when they go from one place to another. In line with Public-Private Partnership projects of President Aquino, this travel navigator gives people the chance to use technology and information to control their time as they travel with more convenience. The nine major roads namely: SLEx, Marcos Highway, Commonwealth, Ortigas Roxas Boulevard, Espana, C5, Quezon Ave, and EDSA can be instantly viewed with the most recent updates every 5- 15 minutes. People who at home, on the road, and at work can all have the chance to view their way with just their phones, laptops and any other gadgets. With the unending problem with the rush hour, people tend to be stuck in traffic wishing they are spending quality time with their loved ones at home or somewhere else. Those who work in Metro Manila would rather leave home earlier than be late because they would not know how would the traffic be. The Metro Manila Traffic Navigator website designed by the all-Filipino web design team, Stray Interactive, empowers Filipinos to see the traffic and plan ahead of time. The design is very easy to understand as it uses color codes for light, moderate and heavy traffic.